Hi, I am interested in your 1967 Chevrolet Camaro RS (stock #1295-NSH) listed on Autotrader for $37,995. I'd like to get more information about this vehicle and confirm its availability. 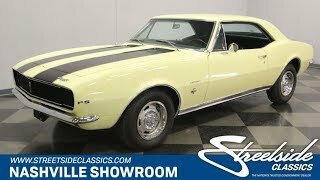 If you appreciate originality, and if you have always loved the clean looks of an early RS Camaro, then this car is for you. It is a real RS that has been carefully and correctly restored so that it is now, what it was then when it rolled off the showroom floor in 1967. Beautiful, desirable, and capable. Take a look for yourself. Presented in the factory original Butternut Yellow with bold Black stripes, this car is a sight to behold. The first two years had the cleanest look for the hideaway headlight grill, stretching completely from side to side with nothing disturbing the look but an RS badge in the center. Being a 67 is just icing on the cake as far as looks go, but is definitely a significant factor as far as collectability. There is a pencil thin chrome bumper underlining that grill and on the side of the car, chrome runs along the rocker panel as well as dresses out the fender wells. Crossed racing flags announcing another desirable aspect of this car grace the front fenders just under Camaro in script. The bold black stripes continue on the trunk lid while rectangular taillights trimmed in chrome with an RS gas cap between them are underlined by another sharp looking chrome bumper. Open the door and you will find a very clean and stock, Black interior. It is also the correct and original RPO code Z23 interior this car was delivered in new. The door panel sets the tone in black with a vertically patterned center panel framed by chrome bands with chrome dressing out the armrest, window crank and door handle. The front buckets seats have a pleated pattern for the center section as well, with smooth side bolsters for support. A wood tone steering wheel is mounted on a 3-spoke hub with a bowtie center button. Behind it is a stock dashboard that has been nicely restored so that the gauges are sharp and clean and the chrome trim shines like new. Ventilation controls in the center include those for another plus with this car, factory air conditioning. The center console is sleek looking in black and chrome and holds the T-handle shifter for the Powerglide 2-speed automatic transmission. An aftermarket stereo is mounted below the dash on the right instead of displacing the factory AM radio. Pop the hood on this car and you will find a very desirable, numbers matching, 327 cubic inch motor that is believed to be the one delivered in this car new. Like the rest of the car, it has been kept completely stock with a black air filter assembly topping the motor sporting its 327 Turbo-Fire 210 Horsepower sticker. Chevy Orange coats all the iron and the metal valve covers have Chevrolet in script pressed into them. The factory A/C compressor and system is still in place and all the belts, hoses and wires are in good shape. The power brake booster and master cylinder appear to have been replaced recently as does the alternator. Power flows back through the Powerglide trans that is also believed to be the one delivered in this car new. The chassis received as much love as the rest of the car in the restoration and while the Flowmaster mufflers may not be original equipment, they sure do make the car sound good! A first year RS with a numbers matching 327. Neat, clean, and original. If this is the kind of car you appreciate, then get on down here and check it out. It is a special kind of car.